I think not many would have led a life without pedaling a bicycle at least in their childhood and it is a dream for every child to get a bicycle when they see other kids enjoy riding their own. I’m no more exception! I got my first (and last) bicycle when I was 8 or 9 years old and although I have a dream for bicycle it was my doctor (whom we consulted for my disorder and it was the time of discovery that I was affected by Muscular Dystrophy) encouraged my parents to get me a bicycle as a part of my exercise. Knowing this, my maternal uncle decides to get us (me and brother) a cycle but it took some time for him and the waiting period was something put us on eager and dream a lot about cycling. My uncle is a car mechanic and had his workshop adjacent to our home and stepping out is indeed into his workshop. After the school we used to spent time in the workshop, apart playing with friends at backstreet and during this time we frequent to cross his sight as a kind of reminding him about the cycle. We had no idea about the cycle, what brand or kind to buy and it is he chooses the right one for us. It was a cycle belongs to the middle category which can either ride by children as well adults if seat was lifted to their comfort height. I think he should have bought the cycle with a perception to ride for long period as we are in growing age then. I still remember the evening he took one of his employ in pillion to buy the cycle so that he can let him pedal to home while he returns in his bike. He bought the cycle for about Rs. 1500. Those days I don’t know the value of money and that price seems to be a huge sum for me and from the size of the bag (a kind of backpack) I thought he should have bundles of currency inside. I have no idea still why he took that bag along with him when the amount could easily slip into his purse. Mom did some puja to the bicycle, which is a custom here to be carried with any newly bought things and it is a belief that by doing such prayer the thing will last long and work good. The next day been a weekend and Saturday, we catch up with the cycle early in the morning and one of my uncle’s workshop employ, Aarumugam, taught us how to ride the cycle. And that was the first time I try to pedal a cycle and within an hour I rode it individual. Our area in Adyar is somehow quiet except the office and school time, learning cycle is easy enough and he (Aarumugam) continue to accompany us through our initial days of leaning and used to hold back the bicycle wherever we go. Though I started to ride the cycle without a support in an hour time, I don’t know how to land and also need someone to hold the bicycle to climb on. At one point he left the cycle and stayed behind or I rode leaving him and I don’t know how to land but that moment (with a turn ahead) I went close to a pile of sand (that unloaded on the roadside for a building construct) and fall/slide over it slowly along with the cycle so I don’t get hurt. And I followed this idea for some time until there was a sand pile. I used to drive bicycle too slowly as I lack strength to put it fast and I do drive alone rarely, as I don’t want to risk falling somewhere. So mostly my brother used to accompany me, at least he follows me not to miss his round. Every evening we used to go for a round in cycle, apart getting conflict between the numbers of rounds, I mostly give away as I could not pedal for long. Sometime my brother used to help me pedal fast by placing his foot on mine, while sharing the seat with me, give his force upon mine. When driving like this one evening, we unexpectedly fall down and my front tooth uprooted fully. It was an unforgettable incident happen with my cycling experience which identity is left in my tooth still. I came home with a bleeding mouth bearing the tooth in one hand. My mom was in quite shock and took me immediately to the dental clinic at the street end, but we had to wait some time until the dentist arrives half an hour later. We don’t know how to handle the uprooted tooth, so folded it in a paper and brought to the dentist. I just remember how we used to bury the milk tooth in mud when it falls; according to our elders instruction and belief that showing it away the tooth will not grow. Perhaps because of that my mom would have folded in papers, but the dentist on arrival reveals that it should have dropped in milk or water to perhaps to keep alive the roots. The dentist fixed the tooth at its place and tied it along with the other tooth using a wire and was left to set on its own. I wasn’t sure getting back my tooth, but glad it decided to grip hold the gums. For today’s good fences meme, run by Run a Round Ranch, was shot from the heart of Chennai. 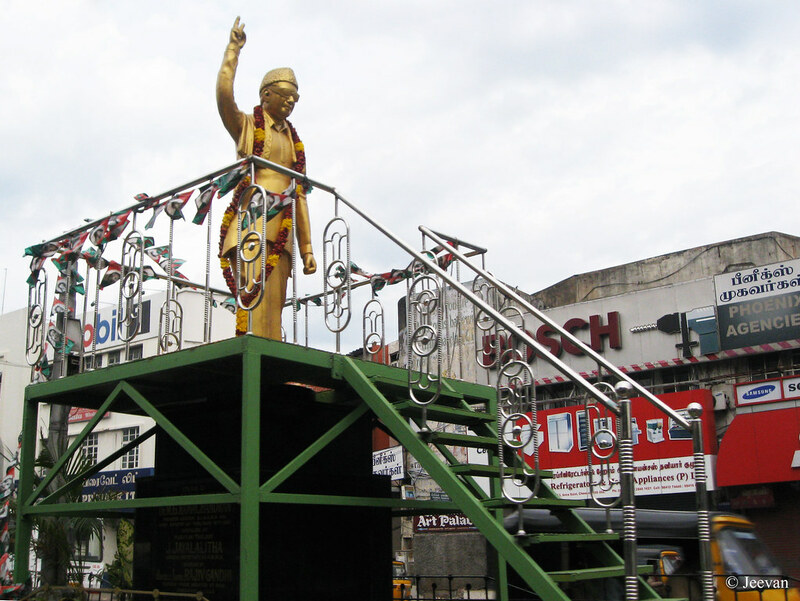 The steel handrail of the statue of former Chief Minister of Tamil Nadu, M.G. 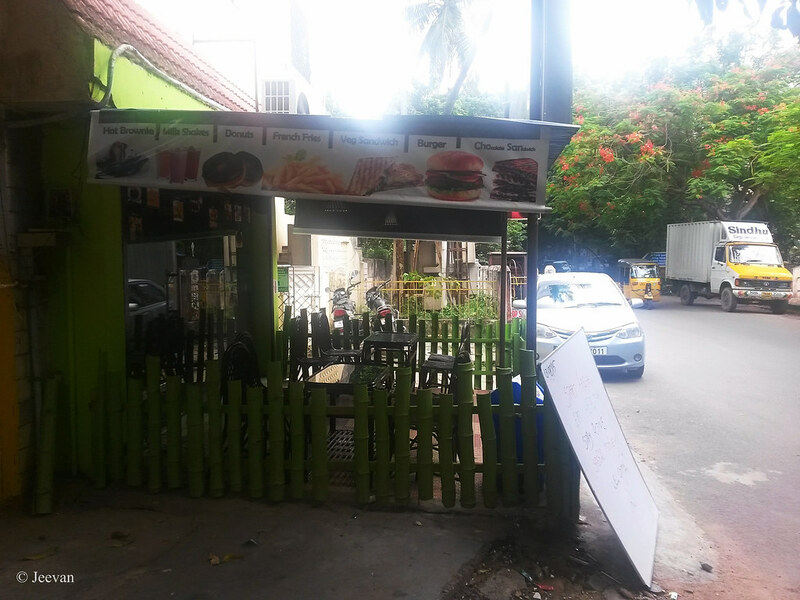 Ramachandran, on the Mount Rd. The bronze statue erected across the Mount Rd, near Agurchand Mansion, was shot while waiting for the signal. Like my previous post on RGB, here is another colorful image that comprises red green and blue. 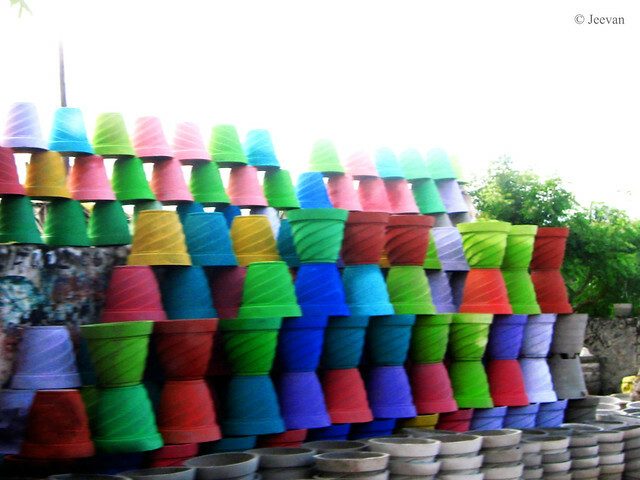 These are colorful concrete flowerpots that kept to sale on ECR! The image expose mild motion as it was shot from moving car. 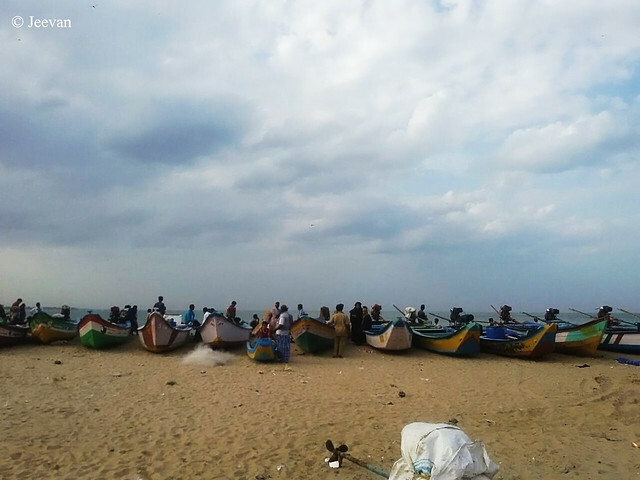 Today, while Chennai (the late Madras) celebrates its 376th Birthday, the number marks the foundation of the city on the establishment of Fort St. George on a small piece of land in 1639 by the British East Indian Company. Every year we celebrate this day as Madras Day/Week marked by various events, and walk on the memorial lanes of Madras. 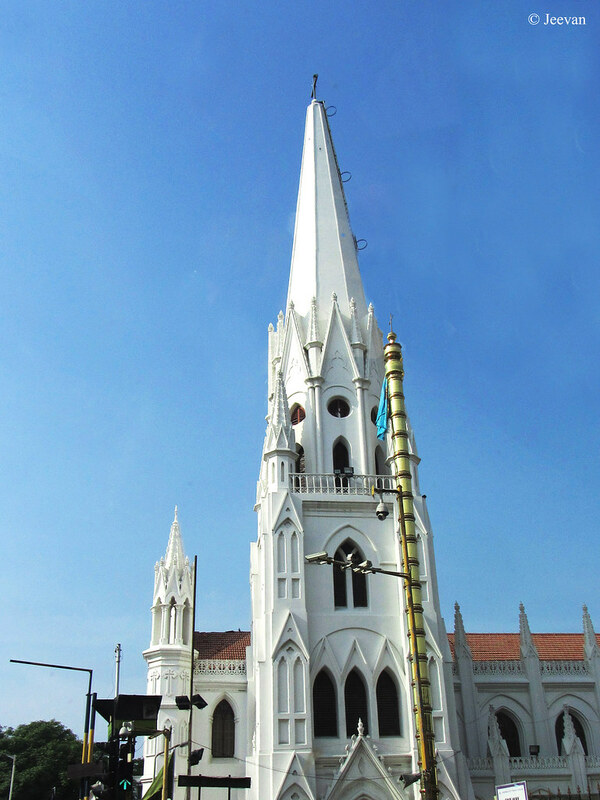 I thought it was appropriate to write on one of the remarkable landmark of Chennai, the San Thome Basilica – also known as Santhome Church. 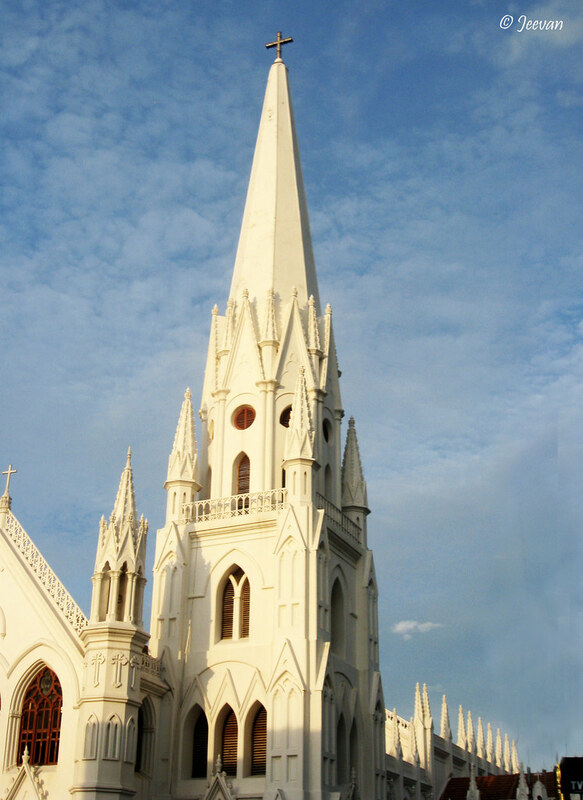 Standing tall against the Chennai skyline in backdrop of blue sky and Bay of Bengal behind, the San Thome Basilica Cathedral (on Santhome High Rd) is indeed an imposing structure. 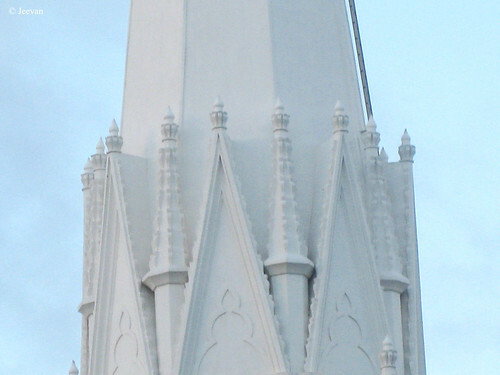 Built in the Gothic style of architecture the spire raises to a height of about 155 feet. This Basilica Cathedral is one of thee Basilicas built over the tombs of apostles of Jesus Christ. The other two are the Basilica of St. Peter, built over the tomb of St. Peter in Rome and the Cathedral of Santiago de Compoostela of St. James in Spain. According to tradition it is believed that St. Thomas came to India in the year 52 A.D and then travelled to Madras after worked along the west coast. As he suffered martyrdom at St. Thomas Mount, his disciples buried him in Santhome over which the present Cathedral stands. Marco Polo, during his visit to India, records that “it is in this province (Malabbar) which is styled the greater India at the gulf between Ceylon and the mainland that the body of Messer St. Thomas lies at a certain town having no great population and it’s a place not very accessible”. When Portuguese arrived at Mylapore in 1517, they were surprised to find a shrine there but to be in ruins almost, they took it upon themselves to rebuild the church and parish in 1524. But over the centuries, this small church becomes fragile and was in dire need of repair. In 1893, this structure was demolished and the present church was built with the tomb of the saint placed at the heart of the structure. The predominant feature of a Gothic structure is its tall spires and at the Santhome Bascilica Cathedal it is the first spire that strikes immediately. The second and the shorter one are constructed directly about the tomb of the saint – which could be accessed from the outside of the church rather being within then and it was in 1956 that the church was declared a minor Basilica. The church also holds a museum inside and all the memorabilia of St. Thomas and of that period was arranged along the display of the spear that killed the saint! ps. all these photos were shot on different times while waiting at the santhome signal. 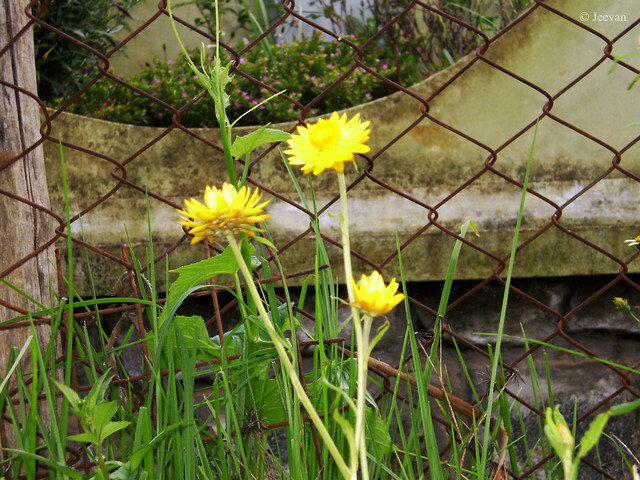 When I browse my folders for photos to share at good fences, conduct by the Run a RoundRanch, I find two photos which have two things in common – a chain link fence and same yellow flowers. 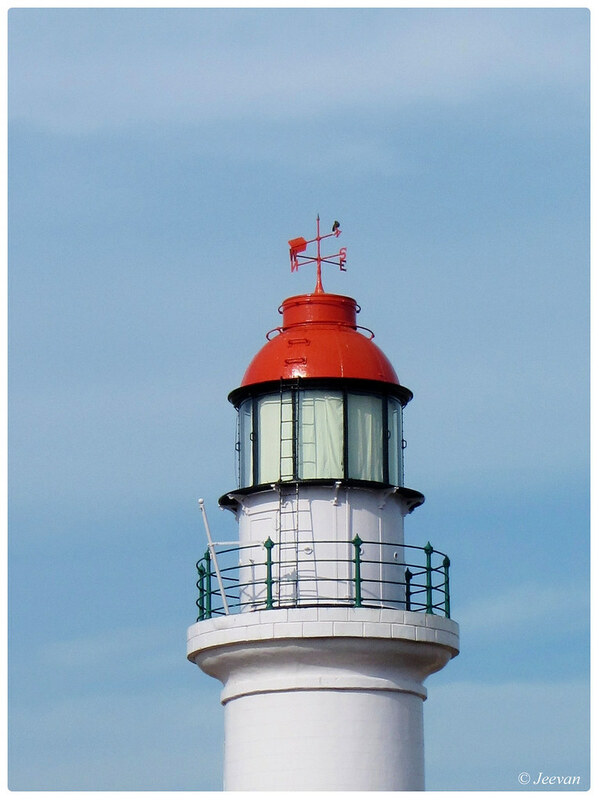 The photos were shot at two different places but there’s one unity between them. Could you guess? Yes, both were shot at hill stations! The first one represents Ooty and the latter was shot at Kodaikanal, both were very popular hill stations here, in the state of Tamil Nadu. The first one somehow went out of focus, because I was actually focusing on flowers but the fence in background scored well! This fence was shot at a place where we stayed during one of our visits to Ooty and located very close to the Botanical Garden it made my visit to garden much easier in my power wheelchair. 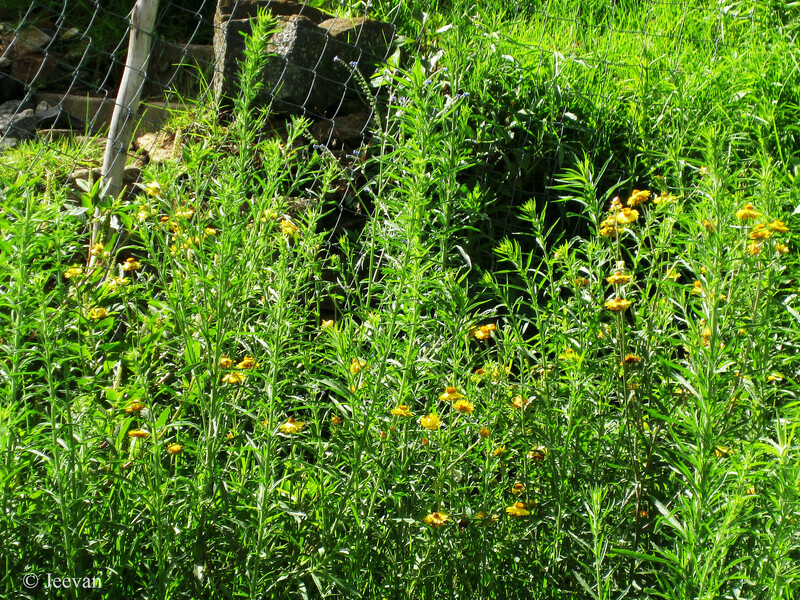 The fence co-exists with lustrous green and yellow flowers was captured at the cottage I stayed in Kodaikanal and the fence was laid as protecting the house from neighbor. This time I decided to go for an image that has colors more than red green blue. 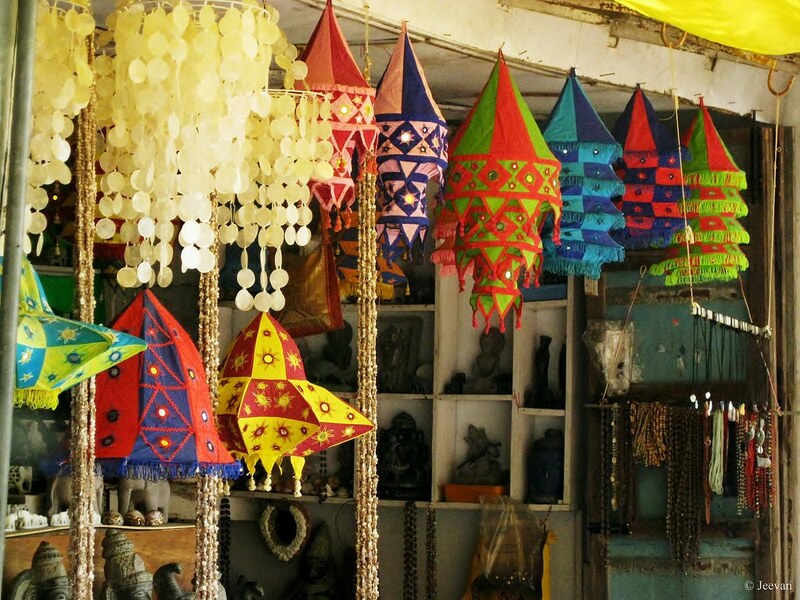 Colorful lampshades hung at a shop in the streets of Mamallapuram – a sculptural hub about 50 km south of Chennai. 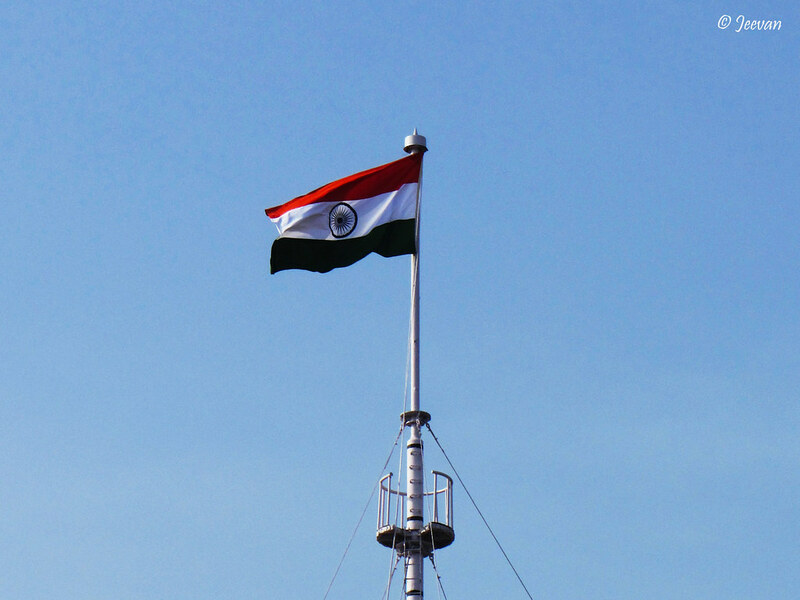 The flag hoisted at Fort St. George, Chennai. And it is believed to be the tallest flagpole in India. First time went to the Chocolate Sandwich shop open by my brother in partner with his friend at Ashok Nagar, Chennai. I was way back applying for a new national Identity Card for Differently Abled, which has been pending for a long time, from the Govt. Institute of Rehabilitation Medicine in KK Nagar. Since the shop located close to the centre and on the way back, we stopped for a cup of coffee that let me check the shop in person as I haven’t visited during its opening in June. 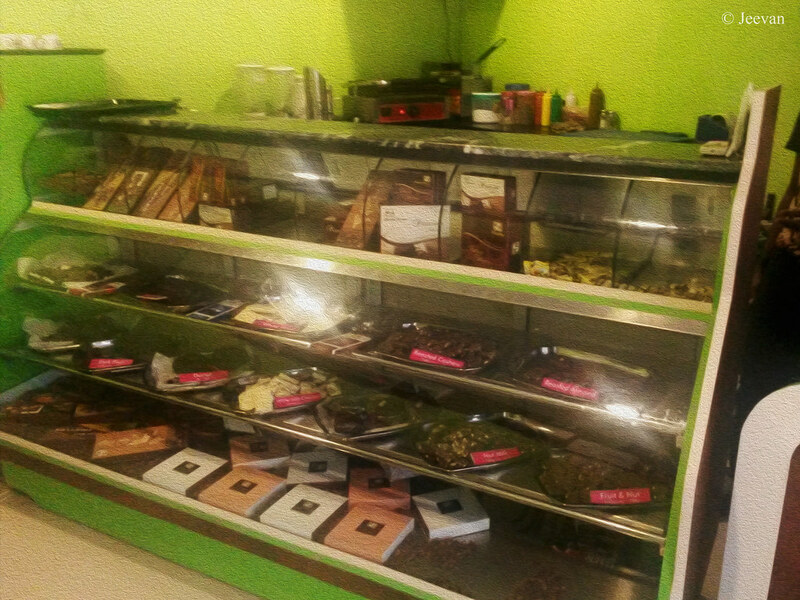 Just like the name the shop sells different kinds of chocolates and sandwiches, along with milkshakes, donuts, burgers, and ice creams with latterly added hot premium coffee. Though it’s not a big shop I like the way they executed the idea, and captured the theme in chocolate brown and green and setting up the shop prettily (opposite to a playground) which I find so ideal. 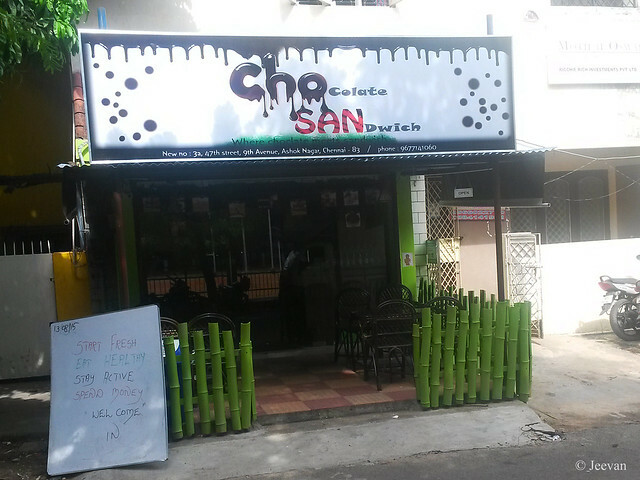 The most attractive thing for me particularly was the sidewalk cafe outside the shop which was fenced in bamboo that gleams in green. 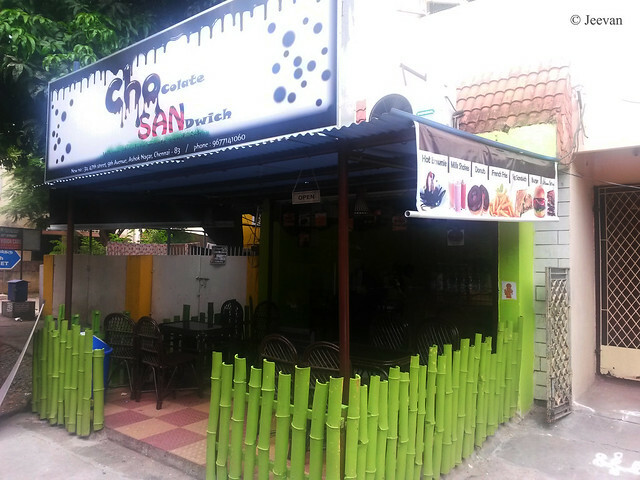 The shop located in a quiet environment unless kids playing at the ground and the sidewalk cafe will let someone relaxes through the evening and ideal for friends to converse. Few weekends back I was at Kovalam beach on ECR and we stopped there for a while when coming back from Mamallapuram on a brief ride come outing. 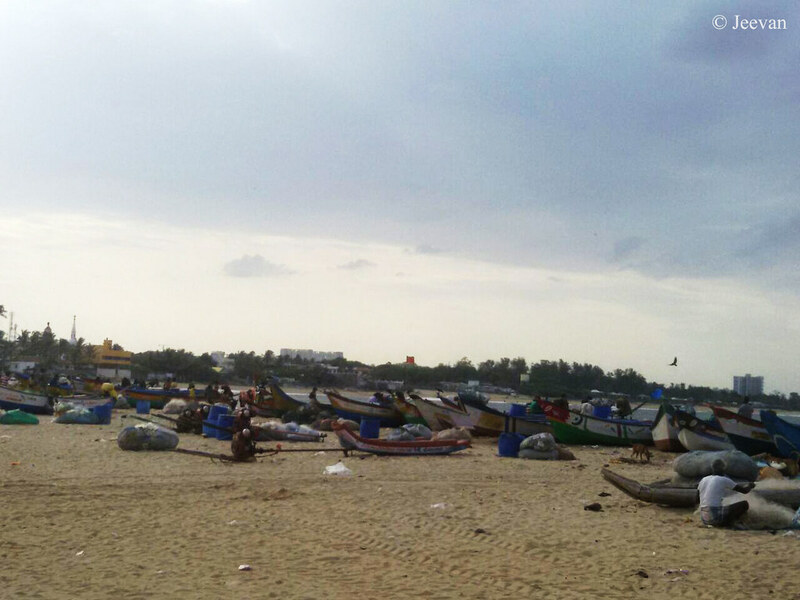 Kovalam being a huge fishing hamlet and being Sunday evening the boats were parked a lot along the shoreline. 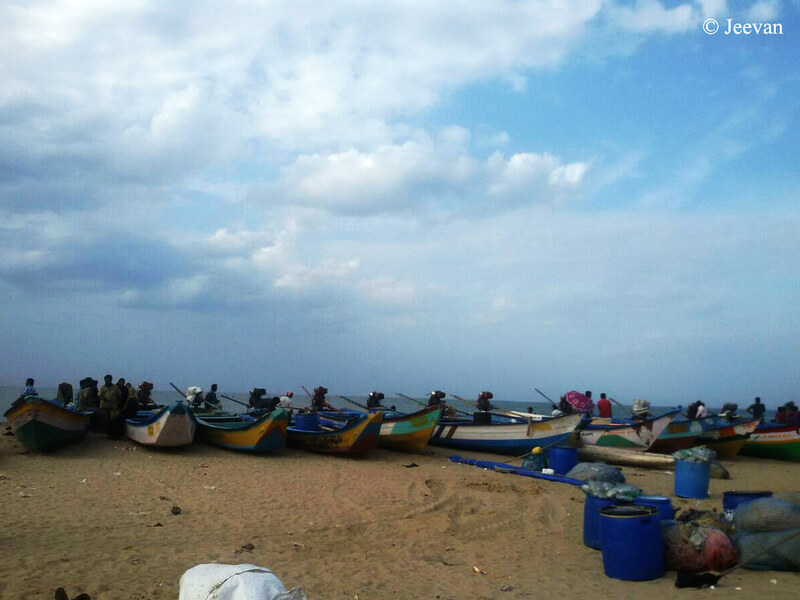 The day was hotter when we hit the road by noon but evening become slightly cool as clouds form around the sky when we reached Kovalam. It was time between 4-5pm so there weren’t enough crowds at the beach but there was constant rise as we wait future and before move out of the area, to avoid getting jammed since this is a beach where lot of people from Chennai’s southern suburbs would visit for mild entertainment. Here are some photos on the fishing boats that parked nearly along the curvy shoreline and as I haven’t took my camera that day, the picture were captured from my sister’s (cousin) Smartphone. A word I hear frequently uttered by the young world these days is “boring”! Though I haven’t met many people uttering the word, but the posture of some of the young people in my family circle and the way they spell it out gives me a perception that many should follow this pattern. Nowadays, I think not many are ready or interested to spent time with others (in person) unless it’s relevant to gadgets someway. But I think they are enriched with knowledge and we can learn many things from them if they like to share with us. But they are ready with their word (bore) at the tip of their tongue, to spit, stopping us at a word without letting a chance to complete the phrase. Though today’s young people (in their teens and 20s) are sophisticated and open to everything, and yet get things easily, their world somehow seem to be confine with abundant or shrunken to get lost interest quickly as they don’t have to wait for anything. I think the young ones these days have no patience to listen to anyone anymore and exhibit indifference in attitude when treating others. Their advanced knowledge works well only on dealing gadgets, and when it comes to relationship and sharing they lack density. I see the reason behind them to utter boring is lies within the definition of the word meant uninterested. During my days of growing (as teen and youth) I don’t remember using the word or felt alike often when the kids in current time period grumble a lot about it. Though I have just come out of the layer, I sense a lump difference in activities and expectation. Even I lost the mobility I have been active throughout my life in some ways and interested to do so many things and interact with others to keep myself occupied and learn something. But the word (boring) come from the tender lips make me frustrated and when they feel bored even not completing a quarter century (and still at the beginning of their life) I wonder how could they become fruit bearer. Today’s young ones expect everything to be instant like washing hands as soon eat away or wipe in napkin to crumple away, and go plainly on the recommended (which seems coping with others) rather selecting the custom way where they could witness hope, and a distinctive feel and inspiration to keep travelling without changing a layer for the other. And I am saying this because they have to understand what their passion is and interested to do, because choosing things on recommend doesn’t meant to suit them. The boathouse located at one of the corners of the Kodaikanal Lake (which resembles the shape of a start) is a pretty one and capture my attention every time I come around the lake during my visits to Kodaikanal. I think it is an old boathouse and perhaps abandoned now, as I ever seen it operated like the other boathouses that gather crowd. 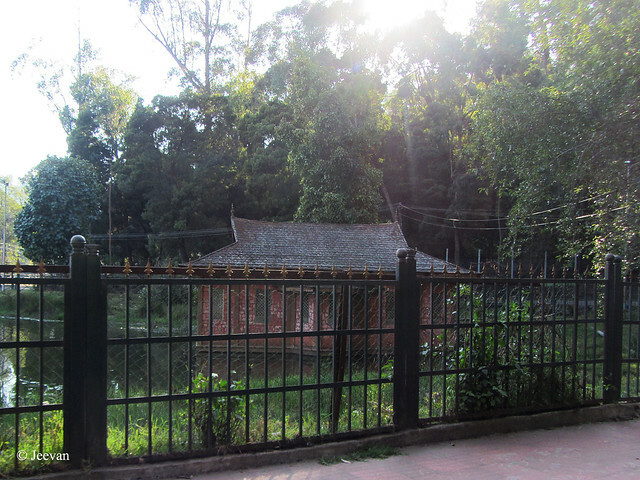 But what I like more about this boathouse was its hut like structure that in a way look alike the traditional houses of China. 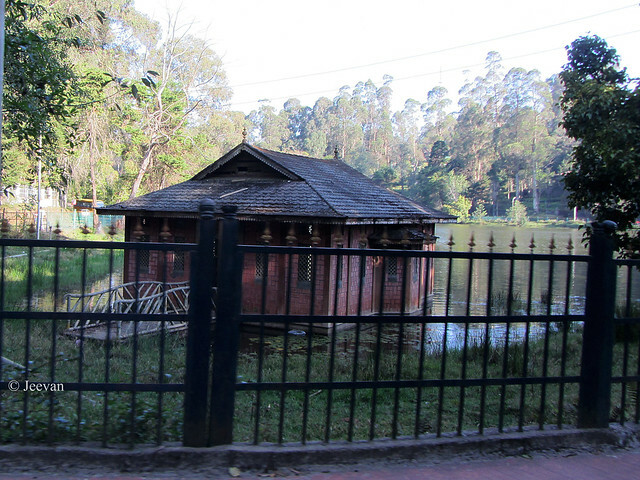 The Kodaikanal Lake has been fenced throughout (to keep away the public polluting the lake) and these are photos shot from the car, so I couldn’t avoid fence hindering the boathouse. Hope I could get a detail photo on the boathouse in my next turn. Prohibition of liquor is possible, quite? A plea for prohibition of liquor in our State (Tamil Nadu) has been there for long and one of the leading political parties has prohibition as their main policy and demanding for it quite long time. 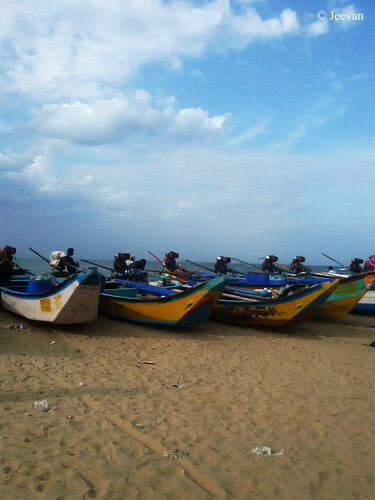 But in last few years other political parties too took flag against the sales of liquor, which was done through Tamil Nadu State Marketing Corporation (TASMAC) – a company owned by state government. Very lately the main opposition party (former) leader promised to bring prohibition in the state if they are back in power, perhaps if they win the 2016 assembly election. But it was like a manifesto that supposed to release with the intention of election, the issue become too serious with the demise of Gandhian Sasi Perumal, during his protest to shut a TASMAC shop. He has been protesting in favor of prohibition for long period on the principles of Gandhi – particularly on the idea of nonviolent resistance. 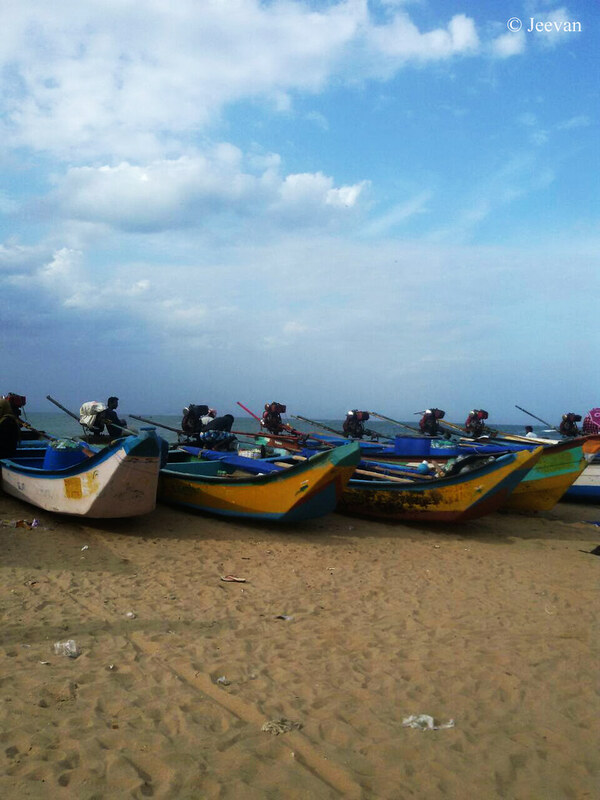 Now almost political parties and various institutions in Tamil Nadu has leap into the issue and urges the state government to implement the prohibition immediately. Some going to the extreme took the issue in their hands to break through and putting fire to the TASMAC shops in the suburbs. Its obvious liquor/alcohol is ill to health and many families suffers because of the head of the family becomes a drunkard and destroy all the economy and hope, his family got on him towards their future. No doubt, prohibition is must! But implementing immediately is quite impossible I think. I also wonder how people, even with great wisdom believe that closing the liquor shops will stop people from drinking. I know if there’s availability people used to it constantly but what if a road blocked? Isn’t there any other route to reach the destination and in this case to get the feel of intoxicated? People don’t think from the mind of drunkards or those addicted to alcohol. It’s not easy for them to stop consuming alcohol suddenly which is somehow possible only in the case of occasional/social drinkers. I know people who live on the purpose of only drinking and seem to be intoxicated always. Even a day or two without drinking put them into troublesome and feel anguish and perhaps there are chances of attempting suicide if they are quite out of control. But it does not mean that we have to let them drink forever (and die soon), but it’s a social responsibility to bring them out of the habit and as a initial step in reducing the number of consumption of liquor, the government and social organisations should encourage those who want to come out of addiction and give treatment through rehabilitation centers for free of cost. On other hand the government should also take step in reducing the sale of liquor rather targeting how to increase the marketing. There has been constant growth (of about 20 percent) at the sales of liquor, from the financial year 2002-03, which proves that those consume liquor has been increased, even though the price could have rose apparently we could not deny the fact and crowd we see in front of the liquor stores. The govt. should come up with creative ideas how to prevent people going blindfold behind liquor bars and also develop an alternate source (parallel) to balance their fiscal lose if they implement prohibition, in a slow and steady progress. Although it’s good to see people (esp. students) come together with great force and protest against the liquor sale and urging the government to shutdown the shops. Instead shouting and taking violence in hand people should think in silence and try to understand where the problem lies and what the ways to prevent drunkard from drinking. I personally feel the film industries and films especially are encouraging indirectly the drinking habit through the scenes of drinking. I find almost films made in recent years have a scene or two that remind liquor even those who want to give up. There’s a singer come lyricist called gana Bala, who write songs that praise liquor and habit of drinking. Wish he stops writing such songs that encourage alcoholics and inspire non-drinkers to the habit. Let whoever comes to the power, promise whatever they want to but make certain the prohibition has been implemented at right method and manner that does not let in illegal booze and other drug items that affect the lives of drinkers to worse. Remote in hand, I was thinking what to post for my new found series. But I got the idea at the moment looking at the remote. And here I got the colors in a single click. 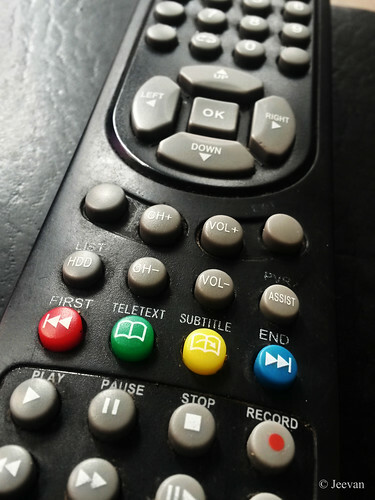 The buttons in the remote and in array of red, green and blue... although yellow interrupt the row I find it apt to the series. The TV remote is one of the objects we handle daily at home. July 31st I turned 30. But I feel nothing turned out to be like people emphasis about the number . For some time now, I consider age as a matter not (instead being a fact) when everyday becomes a record. I think age is only for the body but sometime even despite the fact, and to be stunned someone’s active used to be. For example APJ Abdul Kalam! When I see people complain tedious at very young age, Kalam’s energy level and active lifestyle until his last breath (at age of 84) amaze me and reinforce by belief that age isn’t a matter or barrier until we are sufficient with energy/power. Birthdays aren’t special anymore these years and the day passes like just another except getting attention from family and friends to be greeted. 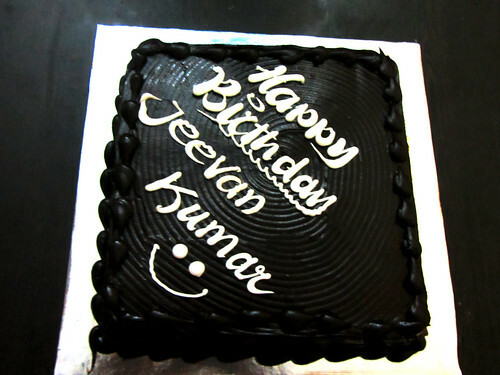 For last few years I had no celebration on my birthday and I also stopped anticipating as I feel nothing turns out if I celebrate or not the day. Last time I celebrated my birthday (with a cake) was in 2011 and after that I don’t have a reason or thought to celebrate. This time too I wasn’t in intention of celebration, but my brother arranged for a cake and since our grandparents are at home this time we decided not to miss the chance. As u perhaps knew my grandpa wasn’t well and after discharged from hospital, he was at our home and supposed to stay until their new home (which is under construction) is ready. Two months have completed now since grandparents moved into our home and grandpa shows great improvement in health and activities after going through (and continue to do) physiotherapy and taking insulin injection for sugar. He put steady and fast pace in walking these days and being affected by Parkinson’s he struggles speaking a word or two and experience loss of memory sometime but wasn’t anything serious to complain.